Maluma is just overseeing his popularity soar like a bird high up in the sky. The Colombian heart skipper is currently touring all around America and the seats are filling up very fast. He would be at the Microsoft theater in Los Angeles, California. The tickets can be booked online and they range from $95 to $350 depending on the seating locations. Since the seats are getting sold out pretty fast, so one should not wait around and just get them. Microsoft theater is huge and boats of the best world class live audio experience. It is honored to host Maluma. The preparations are been given a final touch. Maluma will be performing his most famous songs which have topped the charts and the hearts of his fans in past. The award winning artist is much too eager to meet his fans and get their love from the front. People who want to attend the concert on 26th march can reach the Microsoft theater by flying in to Los Angeles or taking the rail route through different cities. The seats are limited and this concert is guaranteed to be a once in a life time experience. Presenters and producers are trying their best to outperform other shows with this one performance. They want the fans to experience music like never before. Maluma is one of the few authentic Colombian singers who is trying to carve out his niche by exploring new dimensions of Colombian lyrics. He wants to reach deeper in to the hearts of the people by sharing his feelings through the words he has written for them. Th heartthrob is extremely humble and feels more than at home when his is between his fans. The fans just keep on pouring love on the singer and just want to see him more and more. But with a millions and millions of fans around the world, Maluma tries his best to reach out to every one at least once. The spectators are bound to experience premium class presentation when they are inside the theater. The organizers and staff members will be on their toes from the time fans enter the theater up to the time they leave. They would be catering to each and every single persons need with as much courteous assistance as can be provided. They would be on constant lookout for any security breaches so that the audience can enjoy the performance without any hindrance or any later on interference. After all it is Maluma. Who in the world would want to miss this? People are flocking over to the website to book the tickets. Fans are also expected to enjoy the show without creating any situation. Every one is their to enjoy, so why to ruin someone’s experience. Music joins people via hearts with language being no bar. So just enjoy the music and have the time of your life. 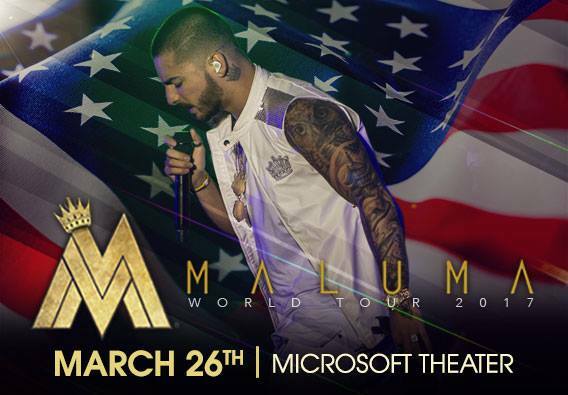 This concert is going to be a refreshing and innovative occurrence for anyone who has not heard Maluma live before.